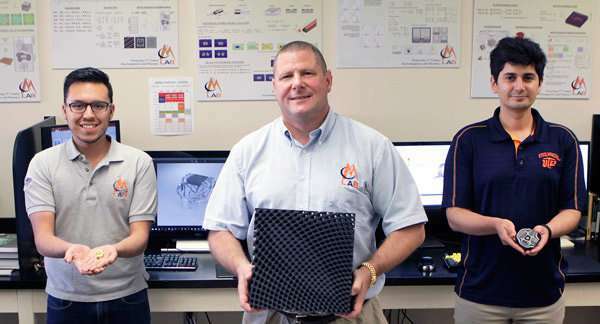 The Schellenger Professor in Electrical Research in The University of Texas at El Paso's College of Engineering leads the EM Lab, a space dedicated to pioneering high-risk, high-payoff concepts in electromagnetics and photonic technologies that are enabled by 3-D printing. "This is a very significant step and potentially disruptive achievement," Rumpf said. "There are many other large research groups that have been chasing this. It's what everybody in this field is working toward and talking about, yet nobody has yet achieved it. 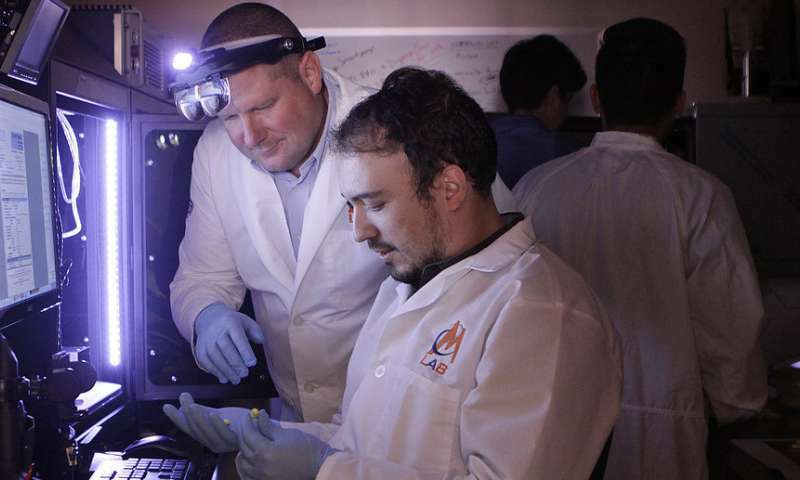 It's sort of the holy grail for 3-D printed circuits, and it was accomplished here at UTEP." Research on the 3-D/volumetric circuit technology was borne out of the notion that a three-dimensional circuit offers more freedom to make circuits smaller, lighter and more efficient. 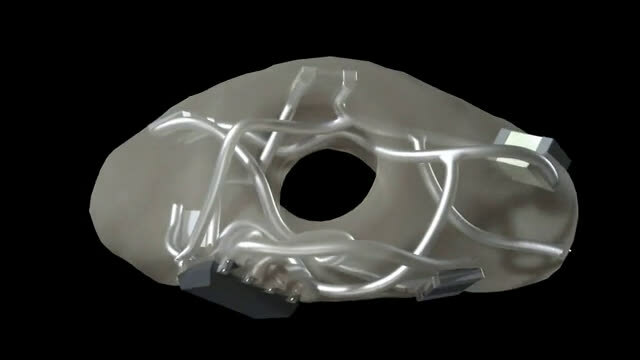 3-D printing allows them to be manufactured into arbitrary form factors that can be integrated into any object or surface. The concept offers many opportunities for the manufacturing industry. Rumpf said this recent breakthrough came as a result of years of research and assembling all of the tools and processes it would take to accomplish. "The last three years were spent developing futuristic CAD (computer-aided design) tools, to produce 3-D/volumetric circuits. These tools do not exist anywhere else," Rumpf said. Accomplishing these achievements took the work of a team of EM Lab researchers—Gilbert Carranza, Ubaldo Robles, Cesar Valle and Rumpf himself. Carranza, a doctoral student, began his research in the EM Lab as an undergraduate senior two years ago. When Rumpf presented the challenge of finding a way to design circuits in three dimensions, Carranza jumped at the opportunity. He used an open-sourced CAD software to integrate his custom functions that allowed the EM Lab to design true 3-D circuits. "We couldn't go anywhere beyond that," Carranza said. "We didn't have the necessary tool to actually translate my design into something that could be read by our 3-D printer." Enter Robles and Valle. The pair are also doctoral students and EM Lab researchers who spend many hours in the 3-D printing room. Much of the last year was spent trying to bridge the gap between Carranza's software and the printing process. At the beginning of summer, Robles successfully completed an interface that could convert the circuit design into code that the printer can read to build the circuit in one seamless step. From there, Valle and Carranza fine-tuned the process and produced the world's first 3-D/volumetric circuit using their automated process. "Getting the CAD, code generator, and 3-D printer to play along well together proved the most difficult step," Valle said. "Typically, when you make a circuit, it's two steps. You start with a thin sheet of plastic. On top of that, you form metal traces, then put electrical components onto that. What our tool does that is unique is it combines these processes, and it does it in three dimensions with complete design freedom. We are now able to load 3-D files, hit 'run' and out comes the part. Literally 'File,' 'Print.'" He added that another aspect of this innovation will be the ability for small businesses that can buy a 3-D printer to become electronics manufacturers with the ability to produce products where each is customized. "In the future, I don't think you will see places, such as major electronics manufacturing companies, churning out billions of things and dominating the market nearly as often," Rumpf said. "Instead, you may have thousands of small businesses in the U.S. churning out thousands of products, both mass-produced and customized. Our 3-D circuit technology may be the first step to change the paradigm of circuit manufacturing. And it may enable us to exploit and incorporate new physics in traditional planar (2-D) circuitry. For the EM Lab graduate researchers, the effort provided real-world experience in the development of a technology that holds great promise to revolutionize manufacturing of circuits. It is something they credit with spurring them to continue their academic careers past their undergraduate journeys. Their breakthrough also offers the opportunity that a business could be incubated in El Paso to commercialize the EM Lab's multiple achievements, something that would keep them closer to home. "I want to stay here in El Paso," Carranza said. "My whole life is here. I didn't think UTEP had anything like this. I expected to graduate then go somewhere else. I never thought I was going to be doing research that could literally change the world until I stumbled upon the EM Lab." Valle echoed those views. "Four years ago, if you asked me if I wanted to get a Ph.D., I would have said, 'no,'" Valle said. "Now, I'm close to getting it. I never considered that UTEP had such incredible opportunities for research like what is happening in the EM Lab." "What we do is extremely difficult and high-risk," Rumpf said. "EM Lab students spend years just developing the tools they need to do their research. They know when they start their research, they're probably going to fail many times, because we are pushing ourselves that far. The type of person willing to take on this daunting level of risk and challenge is what UTEP and El Paso have to offer. It's a personal philosophy, and I don't think we could have accomplished this any other place but here."